The New York Giants are coming off of a disappointing season, which led to some new decision-makers in the organization. The new regime inherits a 37-year-old quarterback and some high-priced free agents on the defensive side of the ball. They are middle of the pack in terms of cap space but have some young talented players in line to get paid in the near future in wide receiver Odell Beckham Jr. and safety Landon Collins. The offensive line position requires continuity. 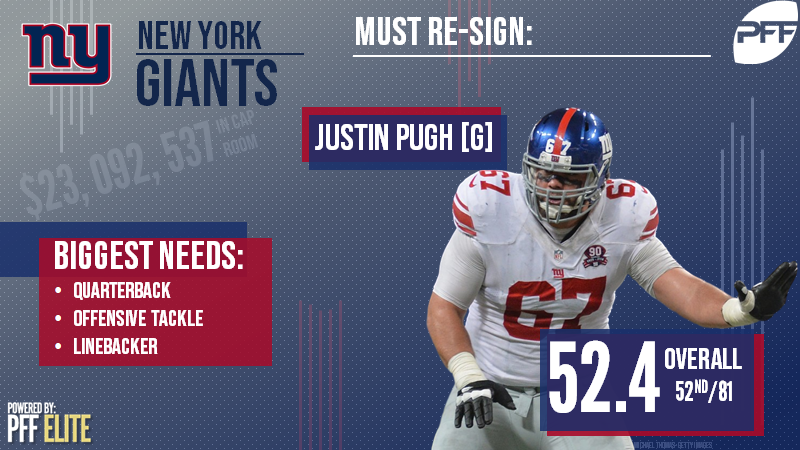 That is something that Justin Pugh has not been fortunate enough to have during his time in New York, as the needs across the Giants’ offensive line have forced him to play left guard, right tackle and left tackle throughout his career. His best seasons came in 2015 (84.5 overall grade) and 2016 (81.2) when he played 75 and 100 percent of his snaps at LG, respectively. His ability to play tackle will be coveted by teams and with uncertainty on the future of the offensive line in New York, it would make sense to bring back such a versatile player. Offensive tackle would be the popular solution, but let’s switch things up. It’s been quite a while since the Giants had a fantastic coverage linebacker. That’s exactly what Bradham is. Bradham’s 0.60 yards per cover snap allowed ranks fourth among off-the-ball linebackers over the past three seasons. He can also rush the passer when asked to blitz in James Bettcher’s aggressive defensive scheme (10.8 pass-rush productivity ranked 25th among 88 off-the-ball LBs in 2017). A player like Bradham would change the look of the Giants defense drastically. If the Giants bring back Justin Pugh, John Jerry (71.4 overall grade) is a serviceable player who can fill the other guard spot and therefore it doesn’t make sense to pay a high-priced guard such as Andrew Norwell. The crop of tackles isn’t stellar, but Solder could replace Ereck Flowers at left tackle and at least improve one of the tackle spots heading into the draft. Solder’s 2017 was around average (75.7 overall grade) and the Giants would definitely be hoping they get the player from 2016 (81.7 overall grade) that also showed that production in 2012 and 2013 for the contract he will command. The running back draft class is absolutely loaded, but if the Giants decided to address the position in free agency, you don’t have to look much further than Lewis. He ranked first in the free agent class in terms of elusive rating (73.2) forcing 49 missed tackles. He also didn’t allow a single pressure in pass protection on 35 pass-blocking snaps. Giants fans might want Saquon Barkley; however, there are other ways to bolster the position rather than using the No. 2 overall pick. Lewis might be an intriguing option as Darkwa and Shane Vereen are set to hit free agency.